An object of beauty and admiration, these handmade silver foil beads add a spark of charm to the look of various handicrafts. We are the leading Manufacture supplier exporter of Silver Foil Big Hole Glass Beads and offer this product as per client requirments . Each bead made by hand over an open flame (lampwork). Our Silver foil glass beads are made using .925 sterling silver foil. The silver brightens the colors providing a different effect than white gold. Design and Size As per pictures shown and we can please manufacture it according to your size, colors, shape etc. Please email us to know the price of this product shown above. We sell this products in pieces and weight. 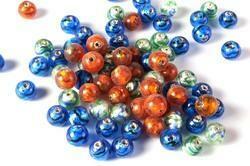 Silver Foil Fine quality Glass beads are available in different colors and shapes. These bright indian glass beads are love by all.. 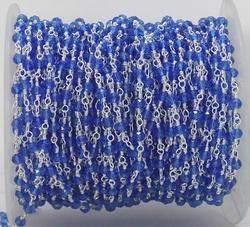 It is widely used for wearing as bracelet, hears ornaments and often used as decorative items. Assorted Shapes and sizes of beads made with 2 different color glass tubes. We have best looking and attractive color combinations. Designed to height of excellence, these silver foil beads accentuate the look of different jewelry items and costumes.